The only constant in life is change. So what happens if your plans change after you’ve bought (and possibly mailed) a money order? What if it goes missing or gets stolen? With most money order issuers, including USPS, Western Union, and MoneyGram, you can cancel the payment. To do so, either fill out a form or take the money order back to the place you originally bought it. Bring identification and any information you have about the money order (ideally, you have a receipt) to start the process. If successful, the issuer will return funds to you in about 60 days. The sooner you act, the better: If the money order gets cashed or deposited (find out if that's happened), you’ll have a much harder time getting your money back. Read on for more details about the process. You’ll need to do some paperwork to have a money order canceled. You can often do this in person, but you can also mail in a form (with Western Union, you can send the form by fax or email, which helps to ensure faster processing). Submitting your request in person is safest—it’s the only way to ensure that you completely satisfy the requirements, and you don’t have to wait for the form to move through the mail. You don’t necessarily have to go to the same location you bought the money order from, although sometimes that’s helpful. You should be able to visit any post office that deals with USPS money orders, and you can use different branches of the same bank or credit union. Keep your receipt any time you buy a money order. It’s best to provide the receipt when canceling, as it contains important information like the money order number and other details. No receipt: If you don’t have the receipt, gather as much information as you have. Even a photo of the original money order is helpful. Without a receipt, the issuer might still be able to find your money order, but they’ll charge additional fees—and there’s always a chance that they can’t find your money order without a receipt. If you still have the original money order, that’s helpful as well. Returning the document to the issuer helps ensure that it won’t be cashed, which reduces risk and can help speed the refund process. Once you submit your cancellation request, the money order issuer will research the item and confirm that it has not been paid. If it is still outstanding, you’ll get a refund or replacement (less any fees). Plan for the process to take 30-60 days, but the timeframe can vary depending on how complicated the situation is. Yes, that is a long time to wait. If approved, some issuers offer refunds, while others provide a replacement money order (which you can make payable to yourself). Already cashed? If anybody deposited or cashed the money order, you’ll typically get a photocopy of the document so you can see who endorsed the money order, and when. If theft or fraud was involved, that documentation can help you and law enforcement track down thieves. It can also help you get your money back (especially if the bank that paid out funds did not properly verify the identity of whoever cashed the money order). 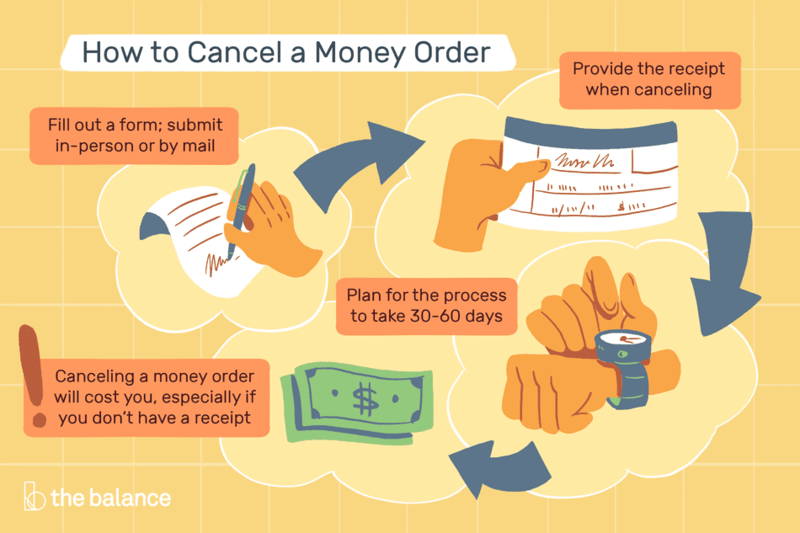 Canceling a money order—or finding out that it’s too late to do so—will cost you. USPS money orders, at $5.95, have the lowest cancellation fees. Western Union charges $15, and MoneyGram charges $18. But prices rise if you don’t have a copy of your original receipt or if you want to expedite the process. It’s best to submit payment along with your cancellation request. In some cases, the fee can be deducted from your refund, but it also slows things down if the money order was cashed (because there’s nowhere to pull the funds from). If you received a payment by money order, you might wonder if it’s a completely safe form of payment, or if your buyer can cancel the payment. To be safe, cash or deposit the money order as quickly as possible—this reduces the chances of cancellation. The money order is fake. The money order will be canceled before you cash it. Some money orders are fake, and con artists regularly use them for online scams. You can try to verify the payment by calling the issuer before you send merchandise, but the absolute safest approach is to cash the money order. Remember that your bank might allow you to cash a money order for 100 percent of its value, but later come after you for the funds if the money order is bad. Therefore, it’s best to cash the money order directly with the issuer. For up-to-date forms and the fastest service, contact your money order issuer immediately.